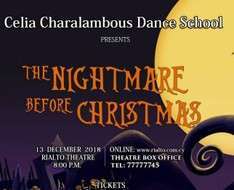 Celia Charalambous Dance School presents "The Nightmare Before Christmas", based on Tim Burton’s film of the same title. The choreographies are performed by fifty of the school’s dancers-students. The story follows the misadventures of Jack Skellington, Halloweentown's beloved pumpkin king, who has become bored with the same annual routine of frightening people in the "real world". When Jack accidentally stumbles on the bright colours and warm spirits of Christmastown, he gets a new lease on life. He plots to bring Christmas under his control by kidnapping Santa Claus and taking over the role. But Jack soon discovers even the best-laid plans of mice and skeleton men can go seriously awry.